The Holy Monastery of Karakallou stands on a hillside between the Monasteries of the Great Lavra and Iveron. It is believed that the Roman Karakalas founded the monastery in the early 11th century. During the Age of Crusade and Caracens raids Karakallou went through decline, devastation and oppression. By the XII century the monastery was desert. It was brought back to life by the efforts of the Palaeologue Emperors Andronicus II and John V and of the Patriarch of Constantinople Athanasius. The number of monks increased and the Monastery was reconstructed. In the 17th century the Monastery of St Nicholas in Ismailia was donated to Karakallou. The other reconstruction of the monastery’s buildings became necessary after a major fire in 1875. Karakallou took an active part in the struggles to throw off the Turkish Yoke. Karakallou occupies eleventh place among the monasteries of Athos, and has five chapels, two outlying chapels, and 18 cells. Its katholikon is a building of the 16th century with additions in later centuries. 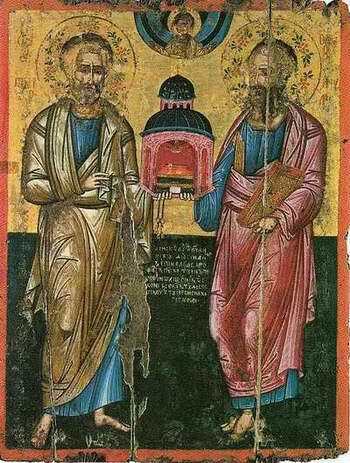 It is dedicated to Sts Peter and Paul. The present refectory of the Monastery is a building of 1875. Today the Monastery is inhabited by approximately 30 monks. Included among the treasures of the Monastery are vestments and liturgical vessels, the skull of the Apostle Bartholomew and of St Christopher, and a fragment of the True Cross. The library contains 279 manuscripts and some 2,500 printed books.